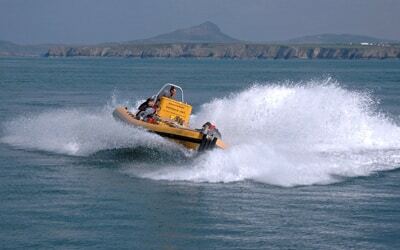 Welcome to the Original Pembrokeshire Jet Boat Experience! 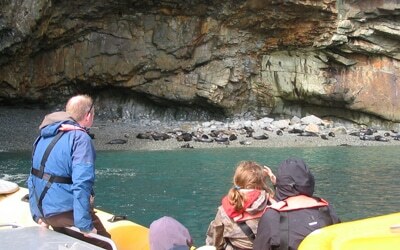 We are unique: the only boat company to offer the fun and excitement of the New Zealand jet boats with the best of Pembrokeshire’s wildlife, uniquely able to explore Ramsey Island’s challenging caves and coves, no propellers to injure wildlife. The boat is one of a kind: aluminium hull, extra large tubes, designed around the New Zealand jet which powers it: tough enough to cope with anything, highly manoeuvrable, able to navigate safely into areas inaccessible to other boats, awesome fun! Our jet powered RIB ventures where no others dare, deep into caves and rock-infested coves, over exhilarating rapids and overfalls. 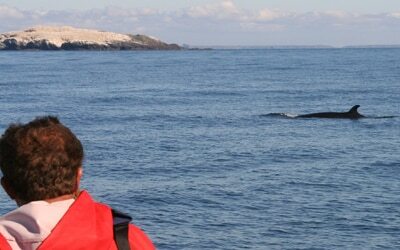 Awesome seascape, world famous wildlife and the ultimate boat for exploring – it’s a great combination. Ideal for adventurous minded people wanting something different. 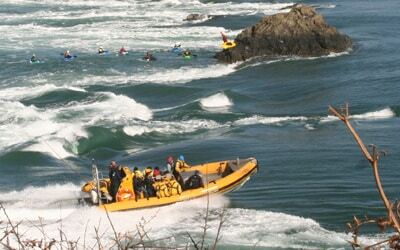 With over 30 years’ experience, no-one has more experience working RIBs off the St Davids coast than we do. We don’t just own the business: we’re out on the water with our passengers, skippering every trip ourselves, sharing our passion for the sea, the wildlife and of course the fun of jet boats! We retired from full time jet boating in 2018 so the the business and / or the boat is now for sale. We're planning limited edition jet boat trips (at normal prices) from late June to September 1st to ease ourselves into retirement. If you'd like to join us simply call us on 01348 837764, email info@venturejet.co.uk or online booking will be available nearer the time. Please see Facebook below and our blog for updates. Unique to us in the UK: the best of Ramsey Island's wildlife (seals, seabirds, porpoises), cave exploration, fun with the jet. A wildlife trip & adventure activity in one. The excitement of the New Zealand jet boats, the best of Pembrokeshire’s wildlife (seals, porpoises, seabirds), rock-hugging cave exploration, fun jet manoeuvres. Choice of Family (age 3+) or Adult trips (for adults & older children wanting a bit more excitement). A wildlife trip & adventure activity in one. Dog friendly. Choice of 1 or 1 1/2 hour trips. 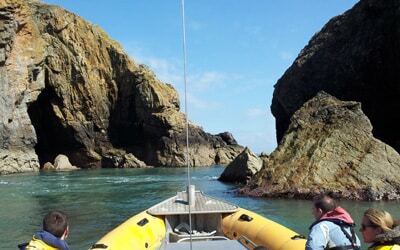 Our classic wildlife trip: the best of Ramsey Island's wildlife (seals, porpoises, seabirds) & caves, no jet boat spins. Experience the freedom of the seals' world, close-up encounters with seals, porpoises & thousands of cliff-nesting seabirds. Spectacular water level views of dramatic sea cliffs, caves and quiet coves. 1 1/4 hours. Dog friendly. Explore the seas off Grassholm, The Smalls lighthouse & the Celtic Deep, one of the best places in the UK to see dolphins, whales & seabirds in their element. Film charter, scientific charter & surveys, stag & hen trips, school & University groups, adventure activity charters, safety support boat. The jet is much more versatile than conventional propeller-driven RIBs, giving excellent control even in strong tides, enabling us to hover for that perfect film angle or to pick up swimmers or paddlers safely (we have no propellers). We can tailor existing trips to you or invent a trip around your interests & needs. Extended exploration of Ramsey's sea caves or Puffin islands, close-up encounters with seals, seabirds, porpoises, fun with our trademark jet manoeuvres. The excitement of the New Zealand jet, the rugged adventure of the RIB: rock-hugging cave exploration, close observation of cliff-nesting seabirds, porpoises & seals 'people watching'. Experience why jet boats are unrivalled for adventure trips: highly manoeuvrable, able to turn on their axis within touching distance of cave walls, awesome fun. Dog friendly. 2 hours. Builds on our trademark jet manoeuvres from the 'Wet & Wild' for those who want to focus on fun: 360° jet boat spins, surfing, power-braking. Unique in the UK. 360° Hamilton turns or 'doughnuts', power-braking & spectacular scenery as we make the most of sea conditions to have fun. Experience our trademark jet manoeuvres, as the jet creates its own white water - high adventure, low environmental impact. Fun whatever the weather! 1 hour. Minimum age 10. Prepare to get wet! Not available anywhere else in the UK!